Electric is very important in our life ,many sources have been use to generate electric.Scientist have create a lot of devices to convert the following energy into electrical energy,for example like hydro energy,geothermal energy,nuclear energy,solar energy and wind energy. There are lot of type devices that generate electricity but solar panel is one of good devices which can carry out in a lot of places especially the are near the equator . The effectiveness of solar panel can be enhance with the following condition like insolation , weather or climate in the area , quantity & quality of solar panel . Insolation is the amount of solar radiation hit on area with a period of time (normally is 24 hours).The solar panel not only available at many place but also produce clean,natural and renewable energy.Their wont release and fume and pollutant to the surrounding which are 100% safe and environmental friendly. The size of solar panel is not big and it wont block the road because it normally install on the roof. The appearance of the house will also nice like the picture above. Not only for the appearance of house but also can maximize the effect of solar panels if place on the roof. Many country has put a great afford to green the country.Like United States,Australia has offer a tax credit and rebates to the household that install green,renewable and clean energy system which include wind energy system and solar panel system . Some states in US even further provide incentive to encourage even more people to install the system in house.Well ,the number of person who install the renewable system are less due to the price of a solar panel and the installation fee of the system in house.The total cost needed to hire from the retailer to install the solar energy system is around $20000. Even have rebate,tax credit and incentive the cost to install it still very high.The real cost of the solar panel is not high but the price sell in the market in very expensive.To make a solar panel the cost need is only about $200 much more cheaper than the retail solar panel. To make a solar panel it was not hard and not required any technical certificate or engineering diploma. It just simple like a DIY, you also no need any expensive tool and equipment and can complete in Short time. 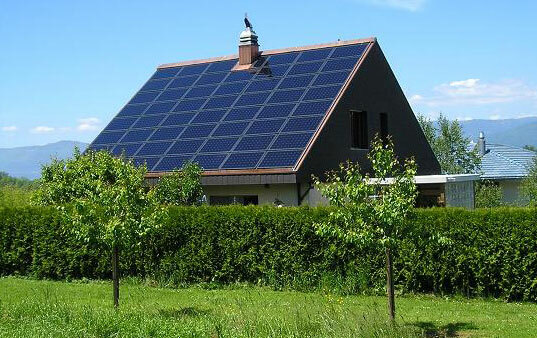 Solar Panel is a good choices to replace the old electric utility company to supply to your house.Then you can slash electric bill up to 30% or even 100% (depend on the amount of solar panel).Once you install solar panel then you no require to pay any more monthly bill to that company.Solar Panel can sustain the amount of electric usage in your house even at night with the help of batteries bank.